Nestled amongst hemlocks &old oaks in downtown historic Montford Hills, stands a grand 1890's Victorian Home and Cottage. Come experience a moment of nostalgia. Enjoy a complimentary bottle of wine upon arrival. A breakfast of fresh fruit, muffins, coffee and juice served daily. Relax on your own private veranda. Herb gardens on premises. 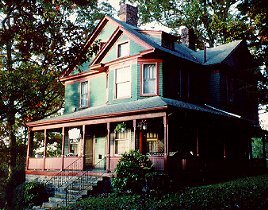 The Bed and Breakfast is One mile to downtown & three miles to the Biltmore Estate. Travelers cheques, personal cheques, MasterCard and Visa accepted. Tarriff $90.00. Check in between 3:00 pm-6:00 pm. Please notify us if other arrangements need be made.